To say I was born into baking would be an understatement (In fact, my family only lived in a house not above a bakery for 3 years during my childhood). I’m a third generation baker, following in the footsteps of my father, and my mother’s dad before him. The baking tradition began in 19__ when my grandfather built a large brick oven in his basement to start a bread route. My favorite photo is of him standing in front of a huge tub of dough at the Carr Biscuit Company. When he opened his first stand-alone bakery, we actually lived upstairs. 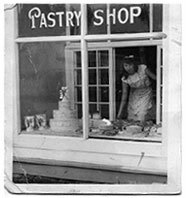 Then my father opened his own bakery, (we lived above that bakery too) and I was always mesmerized by his commitment to high standards. Everything he made had to look a certain way, be presented in a certain way, and of course, taste a certain way. With my father, “good” wasn’t good enough. He always believed that a baked good should be an experience and delivering a substandard product robbed people of that. 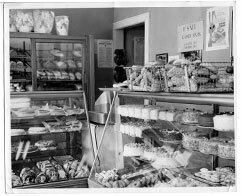 Each day after school I would walk through the bakery front door and help myself to whatever confection I was currently obsessed with. That could be eclairs, Danish pastries, or the occasional unpronounceable delicacy. My baking career began using some of my father’s favorite recipes including his famous cinnamon bread, selected danish pastries, plus eclairs and creme puffs. And once I mastered those, things got interesting. Since then, I have prided myself on my eclectic taste and enduring love to experiment in the kitchen. It’s why with our own company, The Village Baker, we only sell products that meet my father’s gold standard – As Good As Dad’s. Fight for your beliefs. Quality Matters. I grew up around the world. My parents worked for the CIA (I was so well-trained as a CIA kid that I asked his permission to even share that) and so I’ve lived in Germany, Taiwan, Hong Kong, and South Korea. That experience gave me an appreciation and comfort with different cultures and people and I thus have a strong belief in equality. I believe that just a few people can start a movement and change the way a nation acts – and, as a baker, that extends to my and Fran’s mission to rid the world of crappy baked goods! Fran and I both have degrees in chemistry but I ended up really focusing on it. I spent nearly thirty years working in the pharmaceutical industry starting as a chemist and finally as a director of several departments. A chemistry laboratory can actually be thought of as just a large kitchen. Both chemistry and baking have a committed focus on improving quality in every step of any process. Even though it’s been many years since I worked in a lab, I still know my way around a measuring balance. I’m a damn good dishwasher too, although if I may indulge in some chemistry humor here, I’m really slow – because I triple-rinse everything. I bring my leadership and management expertise to Village Baker, even if all the visionary thinking, successes and headaches are for now experienced by both of us. As a business owner you make it or you don’t, but it’s up to you. With The Village Baker, Fran and I are working on our own (delicious) dream, instead of working hard on someone else’s. It was 2009. Kathy was working in an analytical chemistry lab. Fran’s heritage as a third-generation baker was finally starting to catch up with her. Everywhere Fran looked, all she saw was a glut of desserts and baked goods that were mediocre. Boring. Uninspired. In a word? Crappy. Everywhere she went and with every treat she tried, the same question always loomed in her mind: Does it measure up to the baking of Fran’s dad? The answer was usually no. Fran found herself appalled at the inconsistency of the food in many five-star establishments. An exquisite pastry served with terrible coffee. A beautiful dessert set off by a garish paper plate. With this, Fran decided it was time to rid the world of crappy goods. The Next steps was finding a place to bake. Inspired by the tradition created by her father and grandfather, she got to work and quickly developed a reputation for delicious desserts and treats, and soon the orders came in. It wasn’t long before Kathy left her job to join Fran, and found herself packing up the car full of supplies and making regular appearances at Farmer’s Markets. 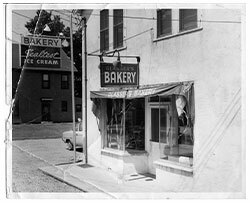 And it wasn’t long after that they settled on the name, “Village Baker” in honor of the family tradition that paved the way.